In flat roof systems, adequate draining solutions must be in place in order to maintain the structural integrity and functionality of the roof. When it comes to sidewall and roof drains, commercial roofing contractors can count on Roofmaster to provide proven and reliable drains that have stood the test of time. For over 50 years, Roofmaster has been provided roofing equipment and tools to both commercial roofing and residential roofing contractors, among these tools and equipment are roof drains. Roofmaster provides a wide selection of specialty drains, such as this 4 Inch Parapet Scupper drain. This drain is manufactured by Marathon, and is designed of use in sidewall roof installations. 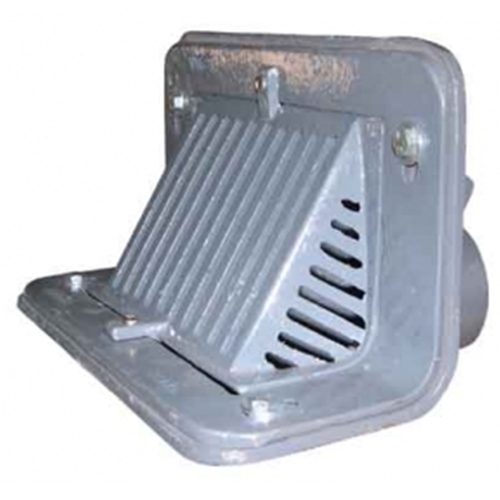 The 4 inch Parapet Scupper Drain is built using durable cast iron and able to withstand years of harsh conditions while still producing excellent results. The design of this roof drain combines both horizontal drainage and vertical drainage by using a reversible hub. This also allows for easy installation of the scupper drain, accommodating both 45 degree and 90 degree installations. The durable cast iron drain base has a standard epoxy paint finish, but an optional nickel bronze finish is also available. The standard angle grate can also be swapped for a flat grate to fit certain applications or usage intentions. Marathon Roofing Products has been providing us with quality drains and materials for over 45 years, with each design meticulously perfected based on practical use and contractor feedback. Shop the Intech Equipment and Supply online store today, or give us a call to order your 4 inch Roofmaster Scupper Drain. Our trusted team of experts can answer any questions you may have as well as assist you through the product selection and order process. For the best roofing equipment at the lowest prices in the industry, be sure to shop Intech Equipment and Supply!